February 3rd was "Setsubun" in Japan. As the beans are thrown towards outside of house , good luck is invited in and bad luck driven. In actual throwing, Japanese people say " Oni wa soto! Fuku wa uchi! " (Evil spirits out! Good fortune in!) It is usually somebody wears oni (demon) mask and they throw beans at him. After bean throwing, people eat soy beans as many as their age, that is thought to bring good luck. 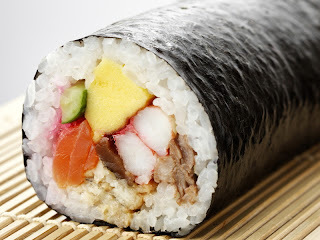 Also, Japanese eat a fortune roll called "Ehomaki" on Setsubun. Ehomaki is a rolled sushi with seven ingredients for the seven gods of good luck. All the good luck and good fortune is rolled up in this sushi. Ehomaki is eaten in the evening, with closed eyes, in silence, facing the auspicious direction of the new year. This years good luck direction was South South East. If you are visiting Japan on Setsubun, you may see people throwing roasted soybeans saying "Oni wa soto! Fuku wa uchi! ".